Helen Graham Turner was born and raised on a farm in Barclay, Maryland, and currently lives at Brandywine Senior Living, in Linwood NJ. She has lived through both World Wars and the Great Depression. She rode to high school in a horse and buggy, traveled around the world, and was a Margate elementary school teacher for 38 years. Prior to teaching in Margate, Helen taught in a 1-room schoolhouse for 2 yrs in Maryland. Helen still belongs to the Children’s Seashore House Auxiliary, for which she has volunteered for years, and the Northfield Garden Club. Helen’s an avid Rummikub player and teaches fellow residents at Brandywine Living at Brandall Estates how to play the game. She never misses walking the community grounds. Previously she crocheted blankets for premature babies for her church that, in turn, delivers them to Atlantic City Hospital. Now she spends time daily knitting scarves for her many friends. Chocolate ice cream daily after lunch is a must! She enjoys mixing with friends, of which, she has a lot…too many to list! Her thoughts on turning 107? 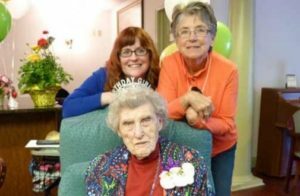 She says, ” I have had more fun since I turned 100!” Well, we wish you many more fun-filled years, Helen. Helen is now, at 107, venturing onto social media. She has her own page which she manages (with a little help). 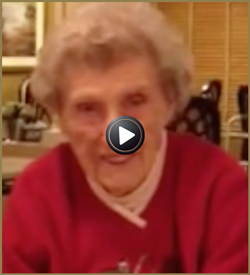 Follow her on Facebook as she counts down to her 108th Birthday! Helen’s wish this year…to dance with Ellen Degeneres on her 108th birthday on April 1st! If you ask her what she attributes to her longevity, she says a “positive attitude!” She also says, “I love life and everything that happens everyday. I have had more fun during the past 7 years since I turned 100 than I ever had before that!” Helen was born on April 1st – April Fools’ Day. I guess you can say she is the one who fooled Mother Nature!